You would have to set your time machine dial to 1968 to witness the first of the siblings making time on the then massive 9/16th mile oval. Oldest son Doug raced a mid-1950’s Mercury in the heavily populated “C” class. Lyndon soon joined the ranks with a Chevrolet. Eventually the Late Model field had an all Amick row of numbers 44, 45, 46 during the 1970’s. Some might quickly associate Doug with a pair of mind boggling tumblers he’s taken over the years. During the 1998 WISSOTA Western 100 in Rapid City, with help from a fellow competitor his car was launched into a series of end-over-enders that made the car look as though it had a bad encounter with a crusher. Nearly the same scenario played out last summer. Coming out of turn two, he was nudged into another high flying venture into the stratosphere and left with another mass of crumpled iron. 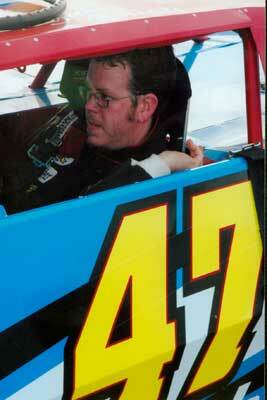 Despite these incidents, and the loss of his crew chief and father, Doug soldiered on. For the last 37 years you could always count on the #46 (or A-1) to pop into the pits ever Friday night. That is, until now. He has effectively turned the keys over to his son, Lynn Amick. Lynn has chosen to continue the number tradition with a #47 as his marker. Even though Lynn has never raced before, his knowledge of this class of cars should give him an edge over most rookies making their debut in this division. Enjoy the rest, Doug. You’ve earned it!